Kunzea sp. ‘Middle Brother’ is a tall shrub or small tree that may reach a height of eight metres. This would make this Kunzea the tallest species in the world. Branches are pendulous. The small leaves are linear and tightly clustered. White, fluffy flowers are crowded along the stems. In summer plants become covered with blooms. Growth habit, foliage and flowers are attractive features. Kunzea sp. ‘Middle Brother’ was previously known as Kunzea sp. A. The present name refers to Middle Brother Mountain one of three mountains on the north coast of NSW, inland from Port Macquarie and a stronghold of K. sp. Middle Brother. This area is now a national park. The species is not common and is restricted to the ranges between Taree and Kempsey on the NSW North Coast. Many years ago, we were on a plant collecting trip for the University of New England on the NSW North Coast. 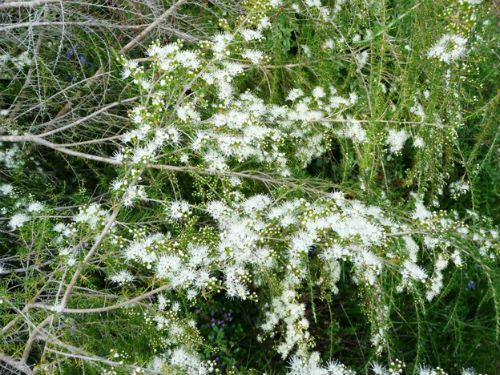 Near the village of Comboyne, inland from Taree, we came across a small tree with pendulous growth habit and small, aromatic leaves. Cutting material was collected and identified as Kunzea sp. A. Becoming, a few years later, Kunzea sp. ‘Middle Brother’. There are now a large number of specimens surviving and thriving in our cold climate garden. In summer the plants become covered in characteristic fluffy white flowers. At this time, plants become the focal point of where they are situated in the garden. Propagation is by seed and cuttings. We prefer cutting propagation as the resultant plants flower much sooner than seed grown plants. In the garden we now have a number of self-sown specimens.